Posted on April 29, 2013 by Susan H.
This Sunday morning I had the pleasure of baking my Allergy Friendly Monday Muffins at my mother’s house. 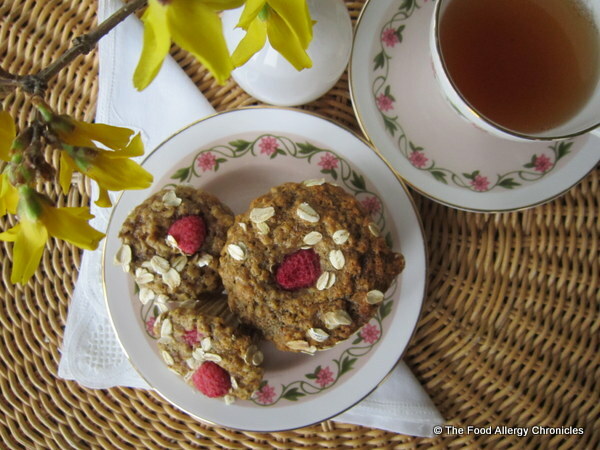 My mother and I love the flavour combination of lemons and raspberries…combined with whole-wheat and oatmeal in a mini muffin…yes please! While out grocery shopping for our evening meal on Saturday…my mother spied a mini muffin tin…the inspiration for the mini muffin version. Mini muffins make the perfect mini snack…especially for my mother who watches her carbohydrate intake due to her being a Type 1 Diabetic. This recipe was adapted from the March 2000 edition of Canadian Living Magazine. 1) Replace 1 1/4 cups of buttermilk with 1 1/4 cups Natur-a Rice Beverage or Natur-a Soy Beverage mixed with 1 tbsp. white vinegar…let rest while you measure the ingredients. 2) Replace the 2 eggs with 1 tbsp. flaxmeal mixed with 3 tbsp. water…let rest over night in the refrigerator (or in the refrigerator as you measure the rest of the ingredients), increase baking soda to 1 1/2 tsp (add to dry ingredients) and add 2 tbsp. of water to the wet ingredients. 3) I replaced the all-purpose flour to whole-wheat flour to increase the fibre. 4) I sprinkled the tops with large flake oats and topped each with a fresh raspberry. In a separate bowl, mix together all the wet ingredients…excluding frozen raspberries. Add the wet ingredients to the dry ingredients and stir to just combine…gently stir in the frozen raspberries. 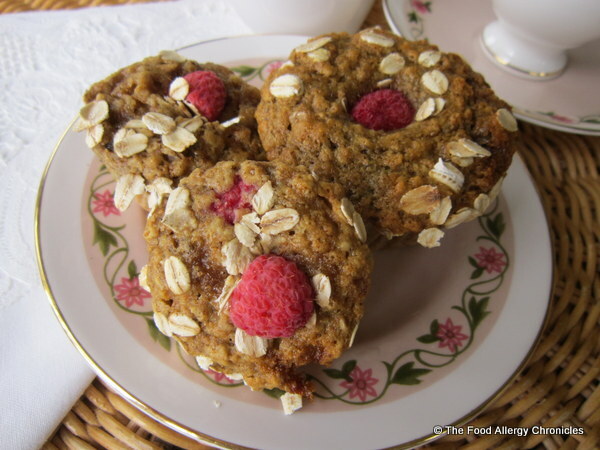 Spoon batter into mini muffin tin…sprinkle with whole oats and top with a fresh raspberry. Bake at 375 F for 10-15 minutes. Let cool on cooling rack for 10 minutes before turning out on cooling rack. P.S. On my drive home from my visit to my mom…I stopped in to see Carla @ My 1/2 Dozen Daily. I thought her daughter’s would enjoy a basket of my freshly baked Dairy, Egg, Soy and Peanut/Tree Nut Free Oatmeal Lemon Raspberry Mini Muffins. P.P.S. Carla @ My 1/2 Dozen Daily’s posted a draw (click here for the story) to support the Brain Tumour Foundation of Canada in support of Joanna @ That Thing I Made‘s friend, Jen, who has a brain tumour. 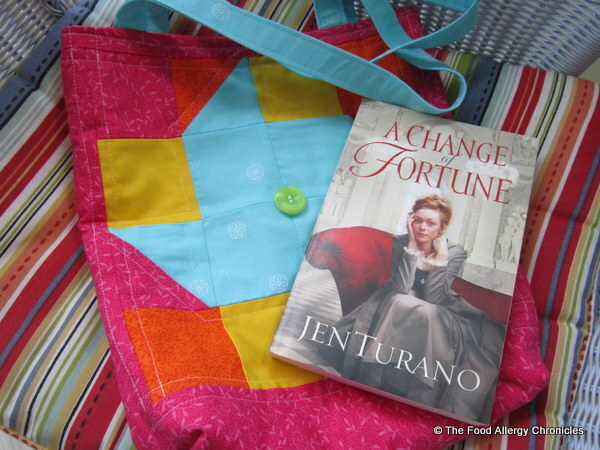 The winner of the draw wanted Jen to have the beautiful tote bag that Carla made, along with a book, so I have brought it home to give to Joanna to pass on to Jen. 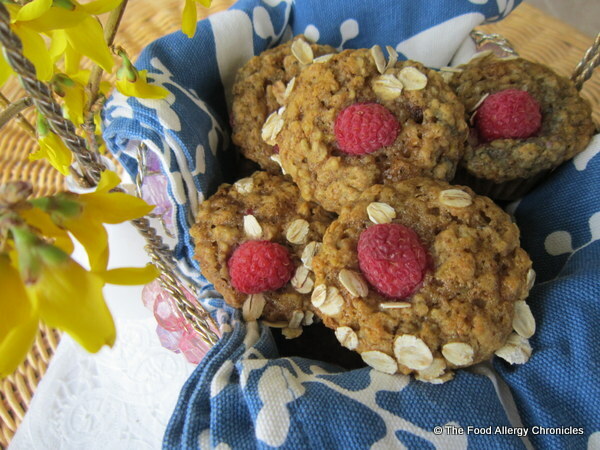 This entry was posted in allergies, baking, breakfast, dairy free, egg free, muffins, multiple food allergies, oats, peanut/tree nut free, Snacks, soy free and tagged Carla @ My 1/2 Dozen Daily, Dairy Egg Soy and Peanut/Tree Nut Free Oatmeal Lemon Raspberrry Muffins, Joanna @ That Thing I Made, Natur-a Rice Beverage, Natur-a Soy Beverage by Susan H.. Bookmark the permalink.